Now ConceptDraw MINDMAP users and FreeMind users can freely exchange their mind maps using the new Mind Map Exchange solution available in Solution Park. Watch this video for more detailed instructions on how to import mind maps from FreeMind into MINDMAP. 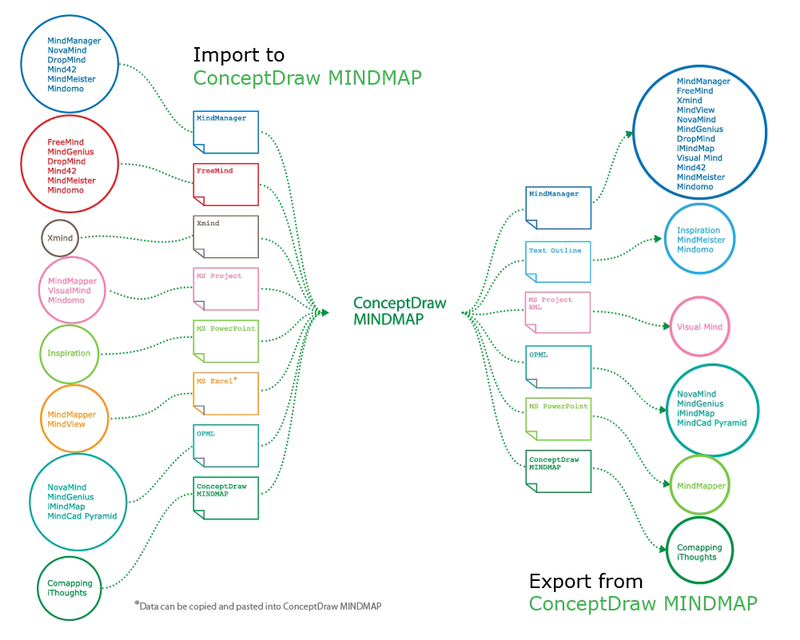 ConceptDraw MINDMAP v10 has impressive import and export capabilities includes following formats: OPML, Mindjet MindManager; Microsoft Office products: PowerPoint, Project, Word; FreeMind (import only); XMind (import only). Now ConceptDraw MINDMAP v10 users and Mindjet MindManager users can freely exchange their mind maps using the Mind Map Exchange solution available in Solution Park. It makes it easy to share your notes with coworkers, associates, classmates, and friends.